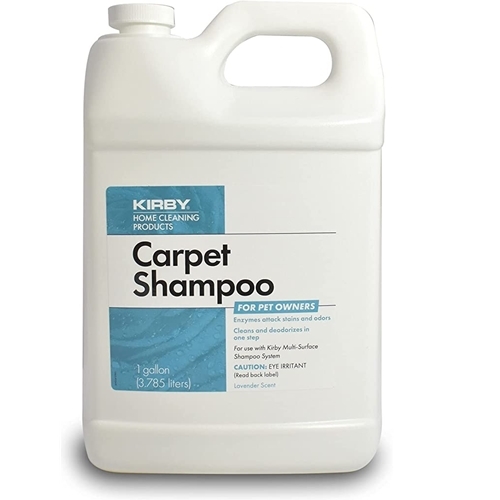 Kirby Pet Owner's Carpet Shampoo is a superior carpet cleaning product. It contains a balance of powerful soil dissolvers and odor eliminators that do two jobs in one! Powerful enzymes digest pet dander, body oils, pet stains, and other odor-causing soils, rather than just covering them up with a fragrance. This product is non-toxic and biodegradable. Ingredients: Water, Cleaning Agent (anionic surfactant), Viable Bacterial + Enzyme Cultures, Fragrance. 1 Gal / 128 oz.